My Dad just started watching Arrow about a fortnight ago and when visiting today, I watched the episode Damaged with him. As I watched it, I slowly realized something that I can't believe I missed the first time round. This episode makes no sense. 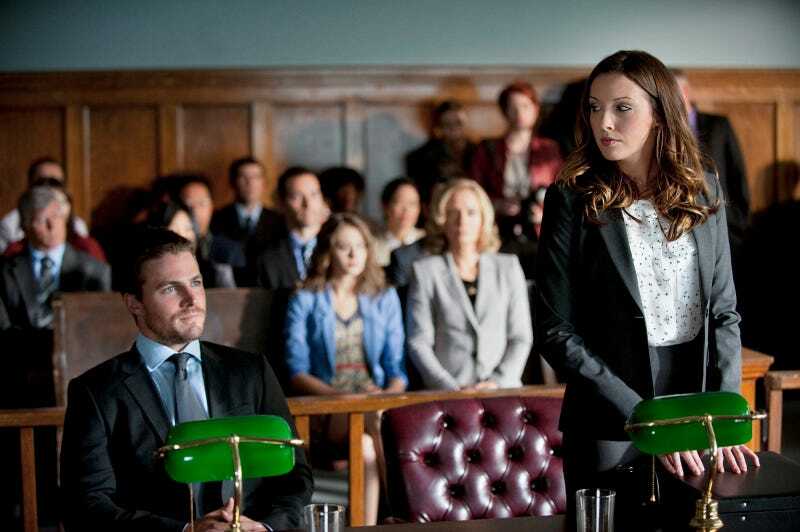 If you don't remember Damaged, it was the 5th episode of the first season where Green Arrow has been arrested for murder, only to be revealed that Arrow intentionally got arrested so he could get the cops of his trail. The problem is that nothing he does in that episode would really help and he would still be under heavy suspicion. First of all, They put a UK GPS Bracelet on Queen. As the police didn't keep a 24/7 surveillance, check on people who he spoke with, check his phone or anything else, this doesn't prove much. Why? Well it's because those tether are amazingly ineffectual, being tricked by simply putting them on dogs or cats, something a hooded would very likely know. The second problem is using a second hood which again doesn't prove much. The hood would most likely have had inspired copy cats (which is proven correct later) and because the cops did a poor job keeping check on him, he could easily of gotten an accomplice which shocker, is exactly what he did. Then there is the whole lie detector test part. First of all, it's so obvious that he's manipulating Quentin during the test, to the point that I don't know why Quentin was allowed to do the investigation solo. In fact why isn't this a national crisis given how high profile his killings and attacks have been? Also, Future Black Canary, it's very easy to fool a lie detector and nearly everyone knows that, why are you surprised he was able to trick it? That scene only makes you look very incompetent. But what is worse is that it is ultimately pointless. Even if the cops can't prove him as Green Arrow, there still going to be suspicious and this stunt will likely make them monitor him even more. Also, you've now add both the media and crime gangs now looking at you more closely Queen. Do you really think sites like TMZ or Defamer would not track Queen like a lion after this? Or that crime gangs wouldn't kill Queen as a warning to Arrow? Am I missing something, I can't remember thinking this when I was watching it the first time.